The ‘Bellini’ – a fabulous fusion of white peach purée and Prosecco – was invented in 1948 by Giuseppe Cipriani, founder of Harry’s Bar in Venice and ardent art lover. The pinkish colour – originally provided by raspberry or cherry juice – reminded him of the saint’s toga in a painting by noted Venetian Giovanni Bellini. He also devised the ‘Carpaccio’ – created for the countess Amalia Nani Mocenigo who was told to by her doctor to eat raw meet – named after the characteristic red and white tones of Venetian painter Vittore Carpaccio. Rossini: as in composer Gioacchino Rossini (rosso meaning red). 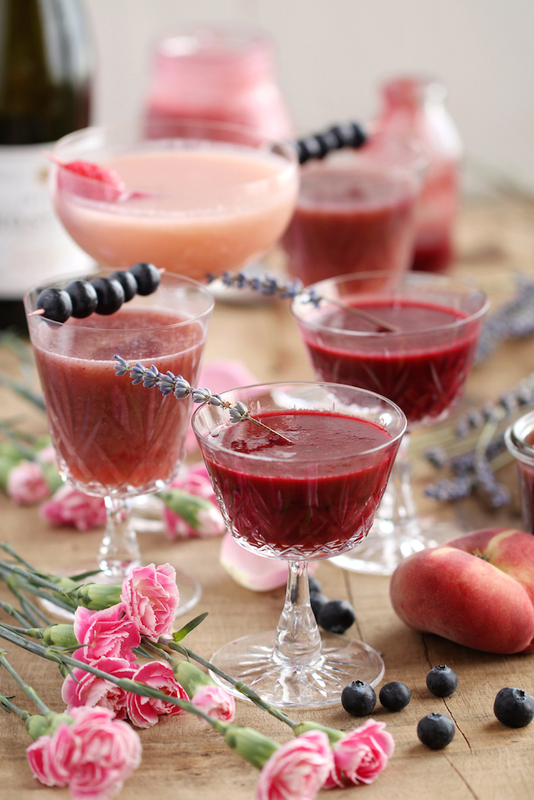 This version is the most famous of the Bellini variations. Mix 2 parts Prosecco with 1 part fresh strawberry purée. Best enjoyed before a glistening sunset at The Gritti Palace in Venice. Puccini: named after Giacomo Puccini, the composer of Madame Butterfly. Mix 2 parts Prosecco with 1 part mandarine/tangerine juice. I imagine that this choice of nomenclature was suggested by his last composition – Turandot – with its hints of Mongol China. Tintoretto: Jacopo Comin, a Venetian painter, nicknamed Tintoretto due to his father being a tintore – a dyer. This cocktail requires 2 parts Prosecco mixed with 1 part pomegranate juice. Speaking of Puccini, in my Rhubarb Bellini post (2015 is clearly my Bellini year!) I’ve already referred to my Venice trip, along with some of the musts in that Laguna city. I forgot to mention that we experienced a uniquely Venetian take on opera at the ‘Teatro La Fenice’ – Madame Butterfly, an opera I hadn’t seen before. Sitting in the extravagantly restored Teatro (it had been gutted by fire some yeas ago) we sat infused with the opulence of its glory days. Out of tune with the fabulous Rococo ceiling, much of the audience was in jeans or loud tourist shorts (hardly Glyndebourne or Vienna). The stage was an altogether more exiting affair where Pierre Cardin slammed into 1970’s SiFi in a Star Wars on acid section where we were taken on a random (and unscripted) journey through the cosmos – so utterly nuts that it was pure genius (almost as mad as some of the shorts in the audience)! After a night of music we made our way home by vaporreto. Perfect! Now for the name of the first of my forthcoming Bellini creations, I will skip any reference to cultural figures and keep it verrryyy simple. 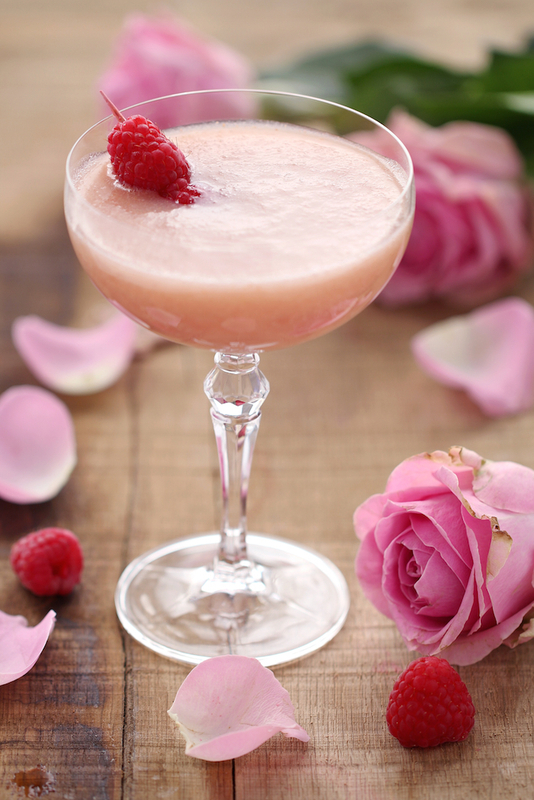 My first creation is called ‘The Lovini’ as it reminds me of Valentines day due to its pink colour and the use of rose scent – all very romantic. As this is a “birthday” post I will skip the health benefits…it’s time to party! Cut the peaches into small pieces, discarding the stone. Add to a saucepan with the maple syrup, if using, and poach on low heat for about 5 minutes. 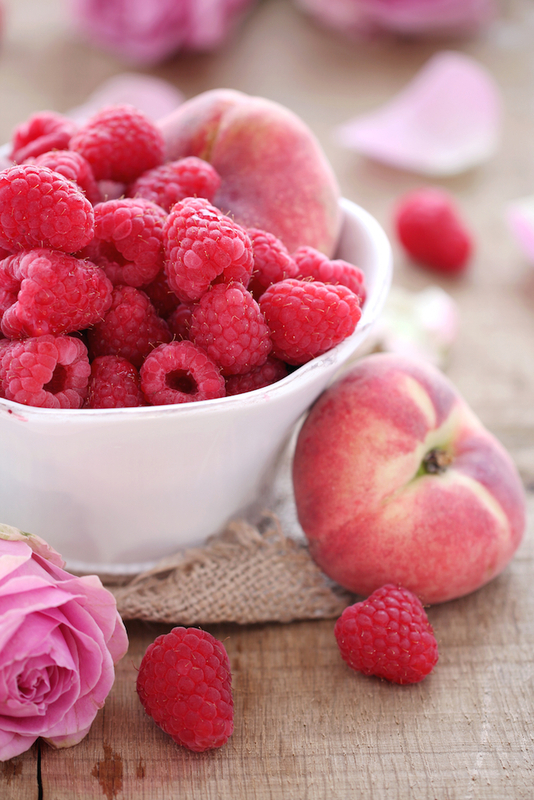 Add the raspberries for the final minute. Set aside to cool down and add the rose water. When cool, blend the mixture until smooth. Put the purée through a sieve if you want it to be smooth – I normally skip this step as I prefer a more ‘rustic’ texture. Add 1-2tbsp of the purée (I use about 1.5tbsp) per glass and top off slowly with Prosecco. Be careful as it will foam a lot, you might prefer to make it in a few steps. Add 1-2tbsp of the purée per glass and the respective amount of Prosecco into a jug (so you can do a few glasses at the time). Stir gently until well combined. Pour into the glasses. 5. As an option, decorate with a skewer of raspberries. Leftovers? Keep ‘The Lovini’ purée and serve it in the morning with yoghurt, granola and fresh fruits or add to your smoothie! Make it alcohol free! Exchange Prosecco with: seltzers, mineral water or lemonade. This entry was posted in Recipes and tagged Bellini, cocktail, culture, drinks, food, food photography, food styling, fruits, Italy, photography, Prosecco, recipe, vegan, vegetarian, Venice by Françoise La Prune. Bookmark the permalink. Happy blog birthday! These Bellini look amazing, such a lovely color. I admit that I never thought about this popular drink’s background and history, most interesting input. Thank you Jade! 🙂 Happy Weekend! Oh you have excelled yourself this time and exceeded even your own, very, very, high standards. A perfectly heavenly post, both in terms of content, recipes and photography. Happy Birthday to one of the best blogs on the block!